'T-Sweeper' instrument on view at IMTS show in Chicago does away with expensive femtosecond laser unit. 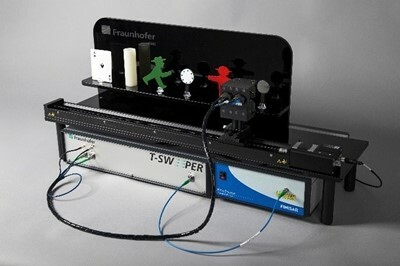 A team at the Fraunhofer Heinrich Hertz Institute (HHI) in Germany says that its terahertz scanner system offers real-time metrology at a much lower cost than is normally associated with the emerging technology. Developed within Björn Globisch’s laboratory at HHI in Berlin, the “T-Sweeper” system is said to be the first to offer such capability without the need for an expensive femtosecond laser source. Instead, the equipment is based around a commercial 1.5 µm laser operating in continuous-wave mode. Terahertz equipment holds huge promise for metrology and security applications because the wavelengths in question �C sandwiched between the microwave and infrared regions �C are able to pass through materials like cardboard, plastics, and clothing, meaning that is it possible to inspect packaged goods from outside, or “see” concealed weapons through otherwise opaque fabrics. But generating such wavelengths of light is difficult, and typically relies on the laser-based excitation of semiconductor materials with 800 nm light. By using standard telecoms kit from Finisar, among others, the T-Sweeper instrument does away with the requirement for an expensive femtosecond source - described by HHI as a “decisive cost factor” in current terahertz equipment. Instead, they mix the beat signal from two continuous-wave (CW) sources, enabling a semiconductor device to convert the light into terahertz radiation. “The wavelength of the terahertz radiation generated can be easily modified by changing the relationship of the laser wavelengths to one another,” reports HHI. It means that the CW systems require no optomechanical components, yielding far more compact and inexpensive terahertz system designs. While the HHI team is not the first to work on that CW approach, Globisch and colleagues claim to have made a key breakthrough with the ability to make several measurements per second �C much faster than has previously proved possible. The T-Sweeper uses one of Finisar’s “WaveSource” programmable lasers, whose output wavelength can be adjusted extremely quickly. “This has made it possible for the first time to conduct material testing in real-time with continuous-wave terahertz systems,” they state. Some members of the team are heading to next week’s IMTS (International Manufacturing Technology Show) in Chicago to show off the capability with a live demonstration, although they first exhibited their novel approach at SPIE’s Photonics West event in San Francisco earlier this year. Said to be more than two orders of magnitude faster than other CW terahertz systems, the T-Sweeper is capable of capturing eight spectra every second, each with a bandwidth of more than 2 THz. However, that acquisition time increases to more than four minutes when the 9-kilogram scanner is set to "high resolution" mode. One suggested application for the technology is in layer thickness measurements �C critical for the quality control inspection of paints and other coatings. Conventional metrology techniques based on electrical probes work for metallic substrates, but with new non-conducting composite industrial materials like carbon-fiber reinforced plastics (CFRPs), other methods are required. “There is a substantial need for a reliable measurement technique, because the market for fiber-reinforced composites is growing in the automotive, aeronautics and wind power sectors,” notes Globisch. And although ultrasound can be used for such applications, terahertz technology has a key advantage because it offers completely non-contact metrology �C meaning that coating thicknesses can be checked before they are completely dry. “In addition, the quality of the results is not dependent on temperature, and multi-layer systems can be directly resolved,” adds the HHI team. And while it remains that case for now that terahertz systems are significantly more expensive than ultrasound alternatives, Globisch sees that changing once series production of the emerging technique is achieved.